Bethany Bay vacation rental condo home at Bethany Bay resort in Ocean View Delaware near Bethany Beach. The home is direct bay-front with spectacular views of the bay and the Indian River Inlet Bridge from most any room and from your screened-in porch! We have already purchased 10 pre-paid passes for you and 9 additional guests in your group (10 passes included in total) so you can use the pools, tennis courts, basketball, volleyball, playground at no additional charge. (sorry but the exercise room is for home-owners only). Golf is also available at an extra fee through the golf shop. The home sleeps 10 via 4 bedrooms, including 3 Master Bedroom Suites (that each have their own private bathroom). You will need to climb stairs to the 3rd floor to access the home but the beautiful layout and views make it well worth it. The Master bedroom suite on the first floor has a KING bed with premium mattress, a private bath and spectacular views. The Family Room features real leather sofas , a large screen Smart HDTV with cable TV connected, and breathtaking views of the bay out to the Inidan River Inlet Bridge that lights up to a spectacular blue color in the evening. FREE WiFi in condo. Smart HDTV allow you to access your Netflix, Hulu, Amazon firestick accounts remotely using whatever accounts you have to use these channels. The kitchen is fully equipped w refrigerator, freezer,microwave, oven, range, coffee maker, disposal as well as dishes, cups, glasses, silverware and baking utensils and all the kitchen essentials. The dining rooms seats 6 and there is seating for 4 more at the kitchen counter / bar - with incredible views. The Screened in porch provides you with absolutely incredible views of the bay, wild life the state park protected marshlands. and the bridge! 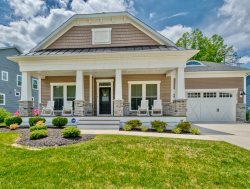 You'll also love your front porch with golf course and water views - great for reading books, relaxing or just day dreaming. This neighborhood is wonderful and the views are truly breathtaking! We are including 8 recreational passes for rental guests to use - they include access to the adult pool, kiddie pool, tennis courts, basketball courts, playground, etc. (Does not include golf which is at an extra fee or access to the exercise equipment room which is available to home owners only).